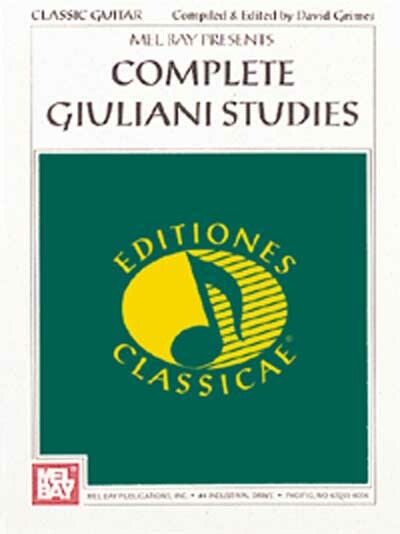 "The studies of Mauro Giuliani (1781-1829) stand alongside those of Fernando Sor, Matteo Carcassi, Dionisio Aguado and Ferinando Carulli as the staples of the didactic pieces by the ""first generation"" of classical guitarists. Giuliani was one of the most celebrated guitarists of his age, a brilliant performer and prolific composer. He left a legacy of compositions, and many of his works are heard regularly in recitals and concerts today. His student pieces are considered indispensable by generations of guitarists. The studies and exercises contained in the six opus numbers here provide some of the most effective material in the entire guitar literature for building and refining a superior technical command of the guitar. In this edition, David Grimes has modernized some of the notation and corrected a number of misprints from Giuliani's original publications.